If you have read through this site at all, you’ll know that incandescent lamps are my preferred light source. From a health and wellness prospective they are superior to fluorescent and LEDs. So I was excited when MIT made a huge announcement earlier this month. 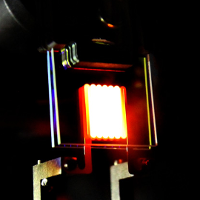 Researchers have created a working prototype of a high tech and high efficiency version of the humble incandescent lamp. This new lamp encapsulates the filament in specially tuned photonic crystals. The infrared wavelengths are reflected back while allowing visible light to pass through. This results in a lamp that looks every bit the same as an incandescent but is far more efficient. Because the infrared is recycled back into the filament, it takes less power to keep the heat output up. This is the ratio between the total luminous flux emitted by a device and the total power input. You can read more about Luminous Efficiency on Wikipedia. This new prototype is currently at 6.6% efficiency but they theorize that it is possible to get up to a whopping 40% efficiency! They state that the crystals allow all visible light waves through. That means that we get all the goodness of incandescents (without the infrared). Color rendering will be better than LED or fluorescent lamps. They will come in at a 100 on the Color Rendering Index where as LED rate 80 or less. Dimming will be more natural and intuitive as the spectrum shifts towards red as it dims. Another benefit is that flicker should be greatly reduced. The heat of the filament should be more stable with two sources of heat. This remains to be seen. As exciting as this is, they are many years from production. More work will need to be done to ratchet up it’s efficiency. Techniques of mass production will need to be developed. With the price of LEDs dropping every year, this new lamp will need to be quite inexpensive to make it to market. There’s also the issue of lifespan. LEDs last up to 50,000 hours; where as, incandescent lamps rarely last over 2,000. If the heat of the filament is more stable than a regular incandescent, it may well last a lot longer. We’ll see. I am keeping my fingers crossed that this will eventually come to mass market, but it’s all speculation at this point. You can read more about this on the MIT news feed.